Doing traffic enforcement on Nordel Way, the area with the highest number of collisions. 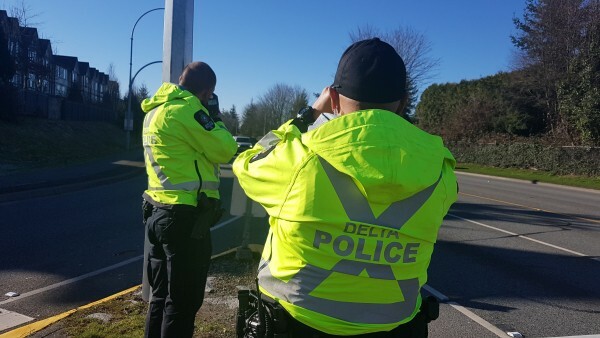 THE trend Delta had been seeing throughout 2018 with a reduction in traffic collisions carried through the 4th quarter of the year with 342 collisions from October through December, versus 367 the previous year. However, traffic enforcement continued its reverse trend, with 2,547 violation tickets handed out in 2018, versus 2,306 from 2017. “The community has consistently told us that traffic is one of their top three priorities, and we’ve focused our resources throughout 2018 to really drive down the number of collisions, particularly in our high-crash locations,” said Delta Police Chief Neil Dubord. In other noteworthy statistics, persons offences continued to be higher than the previous year in the 4th quarter, with 116, compared to 95 in 2017. Persons offences include crimes such as assault, arson and robbery. Because of the increase in 2018, Delta Police analysts looked into the numbers and determined stranger assaults remained minimal, but assaults between family members, co-workers and persons known to each have shown an increase. About 77% of assaults in Delta in 2018 involved people known to each other. There was a substantial decrease in theft from auto, a crime that plagued Delta throughout 2016 and 2017. Reported offences fell from 247 in the last quarter of 2017 to 145 in 2018. Commercial and residential break and enters have seen an increase in the 4th quarter. Residential break and enters are up from 44 to 54, comparing 2018 to 2017. And commercial break and enters have seen a more significant increase with 46 in 2018 compared to 24 in 2017. Delta Police noted a significant spikes regarding commercial break and enters occurring in the Annacis Island region in the second half of 2018, and have been working hard with businesses there to drive the incidences of these crimes down. But more work remains to be done, said police.